Kenosha Pass, is a high mountain pass located in the Rocky Mountains of central Colorado in the United States. The pass is located in the Rocky Mountains southwest of Denver, Colorado, just northeast of the town of Fairplay, Colorado. Geologically, the pass is located atop a large Granite batholith (known as the Kenosha Batholith) that forms the spine of the Front Range along the eastern side of South Park. It is traversed by US 285 between Jefferson and Grant, and provides a route between the valley of the North Fork South Platte River and the headwaters of the South Platte River in South Park. In addition to providing one of the principal access routes to South Park, the pass offers dramatic view of the surrounding Rockies, including the nearby peaks of Mount Evans and Mount Bierstadt. The pass is easily traversable by most vehicles, never reaching above the treeline and featuring easily-negotiable curves along an amply wide highway. The approach on the eastern side is fairly gentle, ascending from near Grant up a gulch at the headwaters of the North Fork. The western side of the pass has a steeper ascent, winding up the flank of a mountainside east of the town of Jefferson. An overlook on the west side of the pass offers a panoramic view of South Park. The top of the pass is nearly flat and surrounded by the Pike National Forest, with a National Forest Service campground on the summit. The pass was used by Ute bands to reach the hunting grounds of South Park. In the 19th century the pass was used by white trappers to traverse the Front Range. During the Pike's Peak Gold Rush of the 1860s the pass was heavily used by prospectors eager to reach the placer gold fields at the headwaters of the South Platte near Fairplay and other South Park mining communities. The increase in traffic led to the widening of the trail into a wagon road; during the Colorado Silver Boom the pass became one of the main routes of entry for eager immigrants to Leadville, Breckenridge, and Aspen. 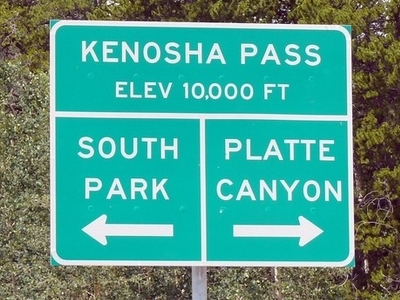 In the South Park episode "The Return of the Fellowship of the Ring to the Two Towers" a sign for Kenosha Pass can be seen as the boys walk from South Park to Conifer to the video store. In the episode "Prehistoric Ice Man," a man who has been frozen since 1996 goes back to his wife, who says he was lost on Kenosha Pass. 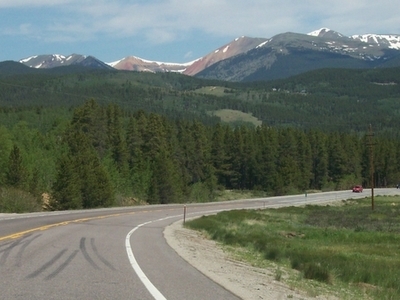 Here's the our members favorite photos of "Mountain Passes near Front Range". Upload your photo of Kenosha Pass!